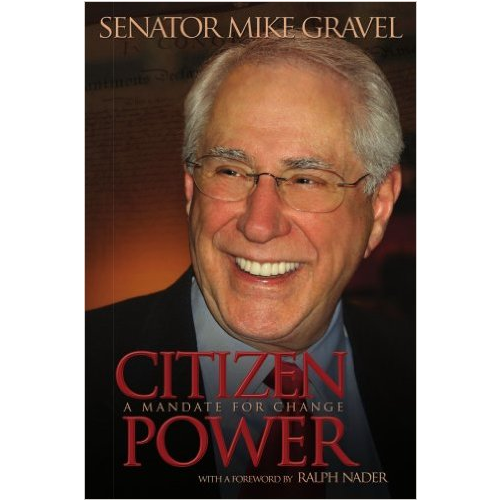 As author of Citizen Power in 1971, Senator Mike Gravel determined that much of what he wrote then is apropos in America today; hence, the release of Citizen Power: A Mandate for Change that reflects the accuracy of his evaluation of problems then, his current position on a number of issues facing America now, and the process that Americans can undertake to become empowered as lawmakers in partnership with their elected officials. Most chapters of Citizen Power: A Mandate for Change present material from the original book, as well as new information and revised positions. The exceptions are Chapter 2: The National Initiative, and Chapter 7: The War on Drugs. All other chapters cover similar topics in both books, but with the senator’s fresh insights for today’s world. Each chapter ends with how the National Initiative, once enacted, could help solve the problems presented in that chapter. The Table of Contents is as follows: Chapter 1 – Now It’s the Citizen’s TurnChapter 2 – The National InitiativeChapter 3 – America’s Failure in EducationChapter 4 – Tax Reform – The Fair TaxChapter 5 – The Health Security SystemChapter 6 – National Environmental & Energy PolicyChapter 7 – The War on DrugsChapter 8 – Crime & PunishmentChapter 9 – The Shroud of SecrecyChapter 10 – American ImperialismChapter 11 – Global GovernanceChapter 12 – Who Stole the American Dream?